This week's most popular viral videos include a 3-pound Yorkie with a 30-pound carry-on, a runaway portable toilet, a backflip fail at a Davenport University commencement, seals getting underwater belly rubs, tiny hamsters eating tiny burritos and using virtual reality to see what it's like "living with lag." First up, bigdogLITTLEBODY shared this video of a Yorkshire Terrier dressed in Burberry and towing his carry-on luggage around the airport. In the next clip, Dan Pearce says his town was getting wind gusts up to 75 mph, causing this commode to go cruising. Apparently, seals are just underwater dogs. Scuba diver Jason Neilus shot this great GoPro footage of the friendly creatures enjoying a belly rub in the UK's Farne Islands. Then, one Davenport University graduate was so excited to receive his diploma, he decided to do a backflip on stage at his commencement ceremony. But, as this video from Mark Fay shows, it didn't go as planned. Comedy video company HelloDenizen is off to a great start. Their first two videos have gone viral. 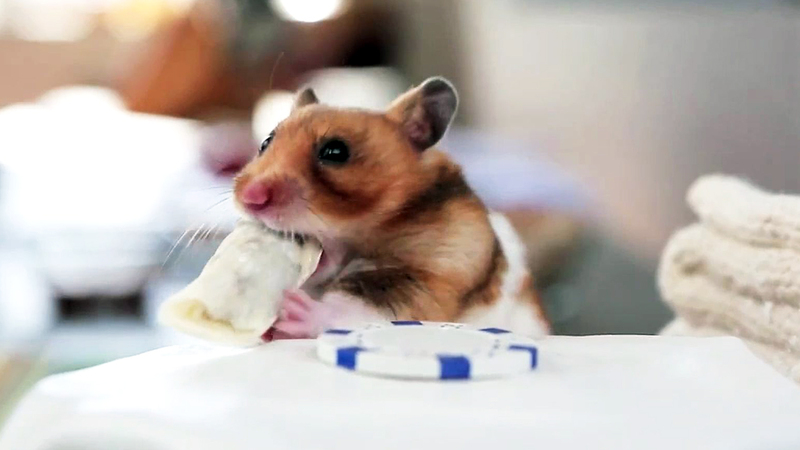 Including this video of hamsters eating burritos that is simply awesome. And, Swedish Internet provider umeaenergi uses Oculus Rift virtual reality technology to show what it would be like living with a real-life version of Internet lag.